Dell’s PowerEdge VRTX hyper-converged appliance can either have all hard drive datastores or all SSD datastores, but you can’t have SSDs act as tiering or caching media for HDD volumes. That’s where VirtuCache comes in. VirtuCache is kernel mode software that you install in VMware vSphere, that automatically caches frequently and recently used data – both reads and writes, from Datastores on VRTX shared SAS storage to any SSD (or some amount of host RAM) in VRTX. By doing so, we improve the performance of hard drive based shared VRTX storage. There are three options for caching media with VirtuCache for VRTX. You can install SAS SSDs behind the shared PERC RAID controller or NVME SSDs in the PCIe slots in VRTX and assign each SSD to VirtuCache in each blade/host. An even higher performing option is to use some amount of host RAM as cache media. Because of the high cost of RAM and the fact that RAM itself is a constrained resource in most VMware deployments, using RAM as cache is not price/performance competitive. 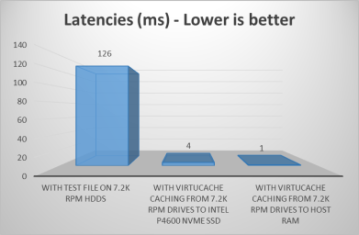 The optimal price/performance caching media are NVME SSDs. For more information about VirtuCache you can review our 2-page datasheet, a more extensive white paper, or in the time it takes you to read these docs, you could probably download and install our software from the ‘Download Trial’ link on the right. VirtuCache is easy to install and you should be able to do this yourself. Sample Cost: Say you have 80TB datastores on VRTX, shared by the 4 VRTX blades, then 2TB NVME/PCIe SSD per host as cache should be sufficient. 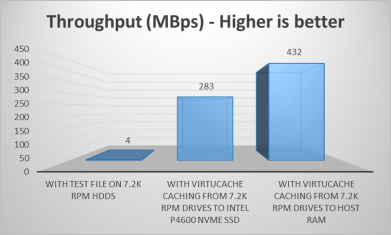 VirtuCache costs $3000/host , add another $1500 for the 2TB NVME SSD. So the total cost works out to $18000 for 8TB SSD cache capacity + 4 VirtuCache licenses. NB : The VRTX shared PERC RAID controller documentation lists support for caching, but that’s very different from VirtuCache style host side caching. VRTX RAID controller caching caches to only 1GB of battery backed RAM on the RAID controller. VirtuCache on the other hand will be caching to much larger amounts of RAM or Flash installed in VRTX. Below are before/after results for Iometer tests (100% Random, 75-25% Read-Write, 4KB block size, 128 simultaneous IO requests hitting storage), with the test file on a hard drive based datastore, first without VirtuCache and then with VirtuCache caching to 2TB Intel P4600 NVME SSD, and a third iteration of the test with VirtuCache caching to some amount of host RAM.